The coconut has maintained its position as the top agricultural crop exported in many forms either as food or non-food classified as traditional or non-traditional, to 130 countries. Exports receipts from coconut oil and other coconut by products reached an unprecedented level of US$ 1.57 billion dollars. The country’s coconut industry has an annual average export income of US$ 800 million dollars. In the years 1979, 1995, 2007 and 2010, the Philippine coconut exports reached the US$ 1 billion dollar level, according to the Philippine Coconut Authority (PCA). Volume of coconut increased by 55.5 percent, totaling 2,355,521 metric tons in 2010 compared with 2009 figure of 1,514,942 metric tons. Coconut oil remains the top coconut export product. According to the PCA, the month of August is traditionally the peak of coconut fruiting season. Thus explains why the coconut festival is mounted within the month as a tribute to the versatility of the so called Tree of Life. The festival, the National Coconut Week, was celebrated in the wake of government’s National Coconut Productivity Program, which recently welcomed to the industry nine million seed nuts. The seed nuts are now taking roots nationwide through PCA’s participatory planting project. The PCA administrator Oscar G. Garin has announced that productivity of 10 million more coconut trees has been enhanced through a process called Salt Fertilization. The PCA is spearheading a campaign among farmers to fertilize their coconut farms with two kilos of salt per tree per year for three years to increase yield by at least 25 percent. Salt fertilization is believed to increase thickness of coconut meat and also increase the number of nuts harvested. 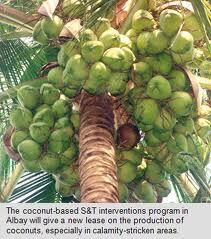 The procedure is also credited for making coconut trees resistant to drought, pests and diseases.